Successful development starts with a solid plan. But when time, budget, and quality are fixed, as they are in an agile software development, how can you predict the scope of work your team can accomplish in a sprint? The answer, of course, is historical data. Velocity charts are an agile tool which display a team's historical speed of work. At a glance, you're able to see exactly how much value your team can ship each sprint. People tend to overestimate how much they can get done in a given time period, resulting in missed deadlines and frustrated teams. Using learnings from our velocity charts, we're able to make much more accurate goals. In isolation, the amount of work completed in one GitHub Milestone isn't very helpful. Factors outside your control – like illness, meetings, or holidays – are certain to pop up. But viewed over a period of weeks, this data provides valuable insight. Velocity charts reveal how much work you can reasonably commit to, which is especially helpful when planning sprints. And because they only use real GitHub data, there's no question as to whether the information is accurate. How does the Velocity chart get created? By using GitHub Milestones and sprint planning in your workflow, the Velocity chart will naturally build itself! As you close out Milestones when sprints are completed, average velocity will automatically be calculated. The ZenHub Velocity chart will populate with the 7 most recent closed Milestones, and display the next 3 upcoming Milestones. If you haven't already, start adding story point Estimates to your GitHub Issues and Pull Requests. Velocity Charts displays the total number of estimates completed in your recent Milestones. To access the charts, select “Velocity tracking” in ZenHub's Reports tab. The chart will automatically display both open and recently closed Milestones, and you can hover over each bar to see more detail. If you have connected repositories together, your Velocity Charts will pull in data from more than one GitHub repo – giving you an even more accurate idea of your speed. 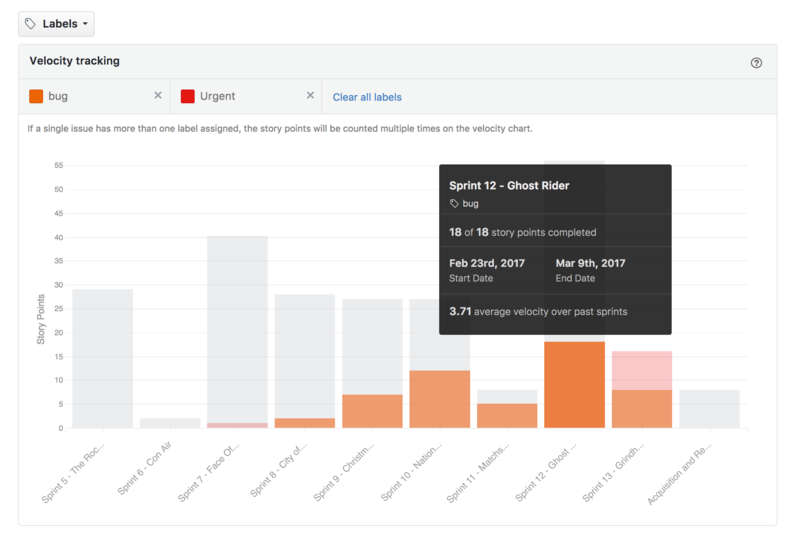 Adding labels to the Velocity Chart allows teams to break down how many story points were closed sprint-over-sprint using a subset of data. This gives additional insight on how team efforts have been spent over the last sprints. More insights empower teams to take action and stay agile, encouraging continuous improvement. Velocity Charts are meant to provide insights on how much work your team can realistically tackle. During short sprints of work, holidays, spikes to setup projects, or other downtimes, it's important to filter these Milestones out of your average velocity to truly reflect the capacity of your team. 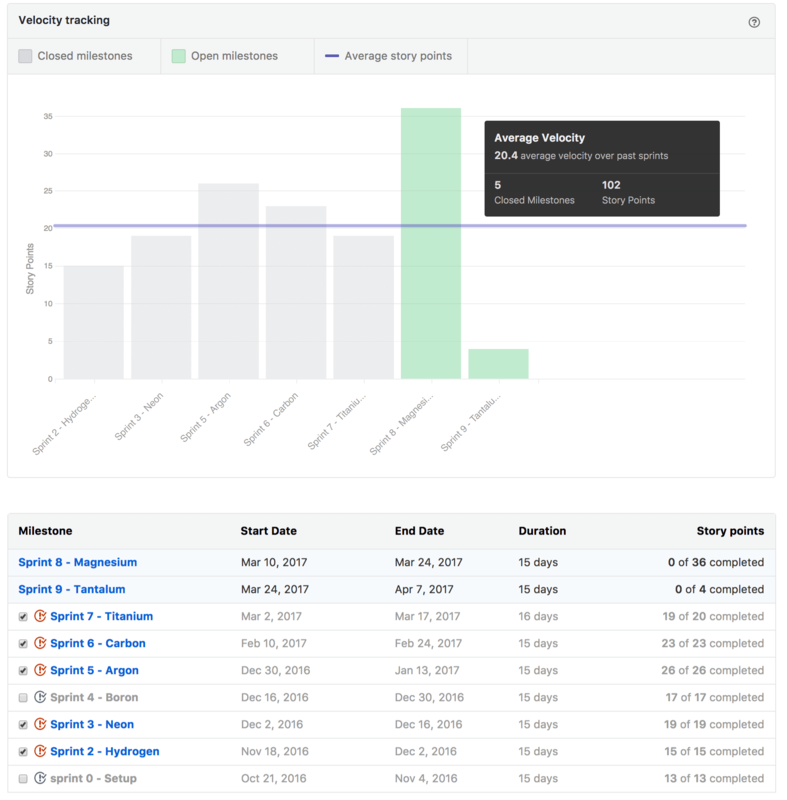 Filter these Milestones from your velocity report to accurately resource plan and ensure continuous improvement is part of your agile workflow. Simply click on the checkbox next to each Milestone in the list on the bottom of the chart.